My favorite part of living in Los Angeles is being able to go to the Hollywood Bowl. Live music under the stars with great food and friends is something I look forward to all year. I cook for days preparing for a four-hour picnic extravaganza. 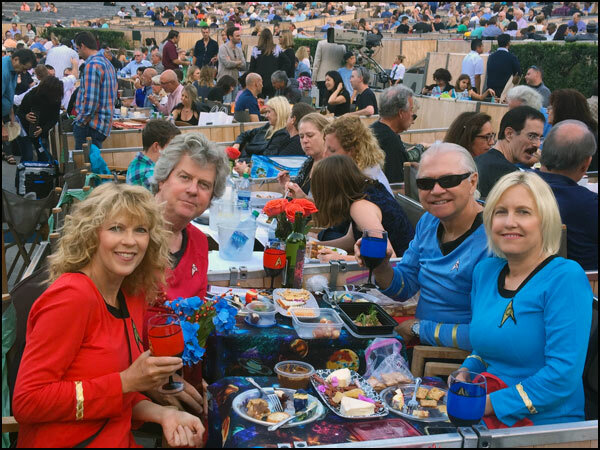 When we purchased tickets to Star Trek night at the Bowl, I assumed it would be full of wildly dressed Starfleet officers and aliens. 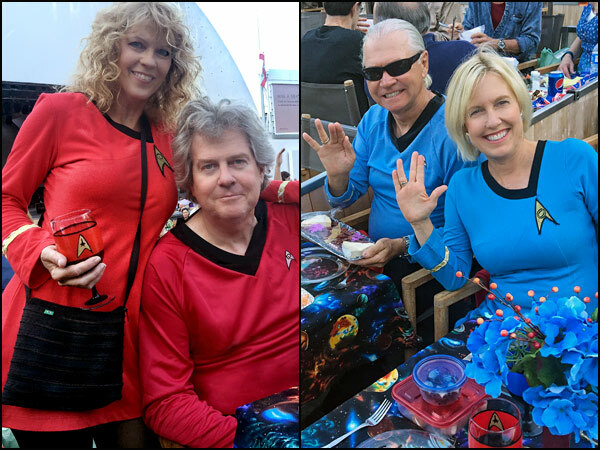 I have never considered myself a Trekkie, but I take great joy in creating a themed party. Turns out we were on our own, in our silliness. We were applauded, photographed and caused heads to turn and eyes to roll all evening. I haven’t had this much attention since I was in my 20’s. Thank you Gene Roddenberry, JJ Abrams & Hollywood Bowl. Here is how our portable picnic of galactic glam all came together. 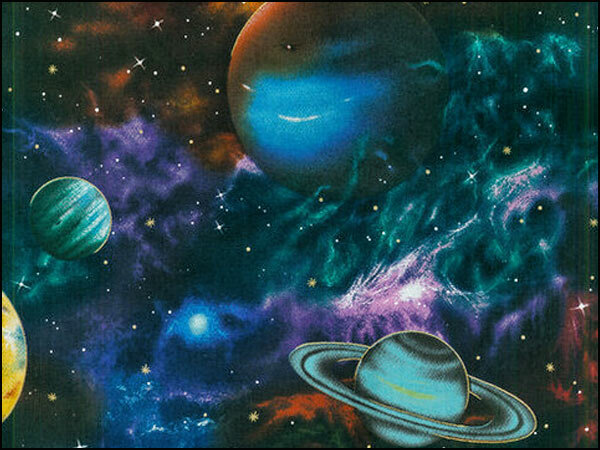 For the table cloth, I found Novelty Cotton Fabric-Large Planets at Joann’s. I used a coupon and was able to make two small table cloths from 1.5 yes of fabric for under $10. I purchased inexpensive glasses at Pier One and acrylic paint from Michaels, all for under $20 to paint my Starfleet regulation glasses. 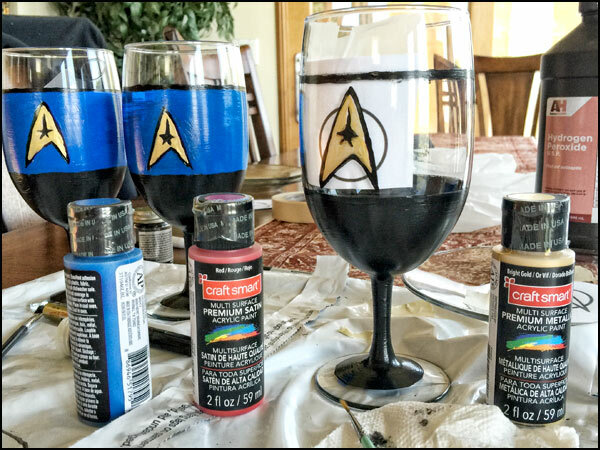 I printed out several sizes of the Starfleet Insignia Logo for taping on the inside of the glasses as a guide to paint. You can download the logos here. If I had more time I would have painted the Insignia logo on clear plates and on the napkins as well. 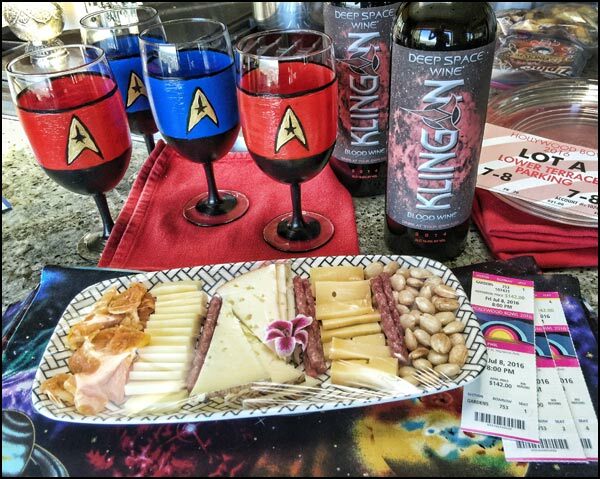 What Star Trek party would be complete without Klingon Blood Wine. I had fun designing these labels. I used Full Sheet Labels (Avery 5265) and printed 2 per sheet. Once you cut them out, just stick them on your favorite red drink of choice. You can download the printable labels here. Who can go to a Star Trek extravaganza without a proper Starfleet uniform? I sure can’t, because good friends won’t let other friends dress normal. I found these classic Starfleet uniforms on Amazon from Cosplaysky. It was fun coming up with a menu that would make Neelix, chef of the U.S.S. Voyager proud. Wild Hibiscus flowers in syrup can be purchased online here and the recipe for the cream filling here. 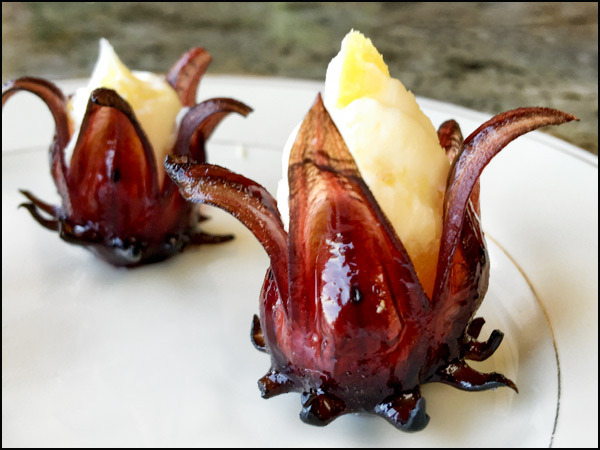 Just drain the alien-looking flowers and pipe the ginger cream into them. 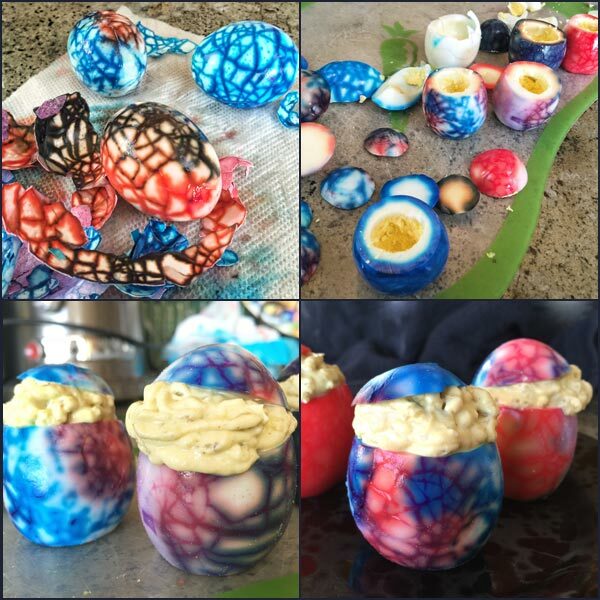 This was my first time marbelizing hard boiled eggs. I followed these instructions from Mom Luck. I used Wilton’s Color Right Performance Color System to create the intense colors. For the stuffing I used this recipe from my Green Eggs & Ham blog post. 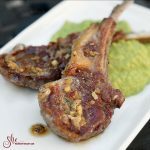 Recipe loosely adapted from Cooking on the Weekends. Assorted Cured Klingon Targ Meat & Coagulated Targ Milk (Dried meats & cheeses). 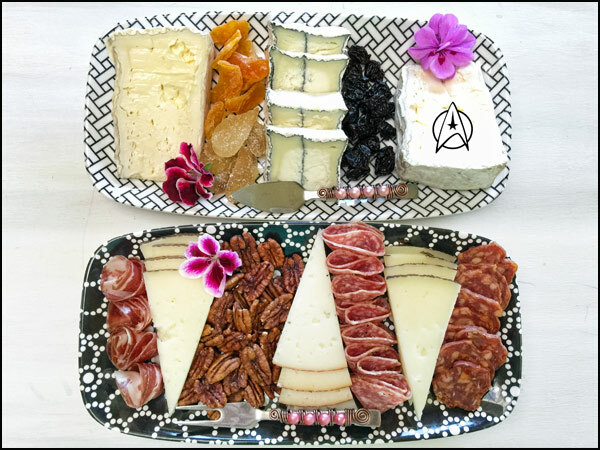 I printed the Starfleet Insignia on acetate to put on top of the cheese so everyone would know it was Starfleet Regulated as safe. 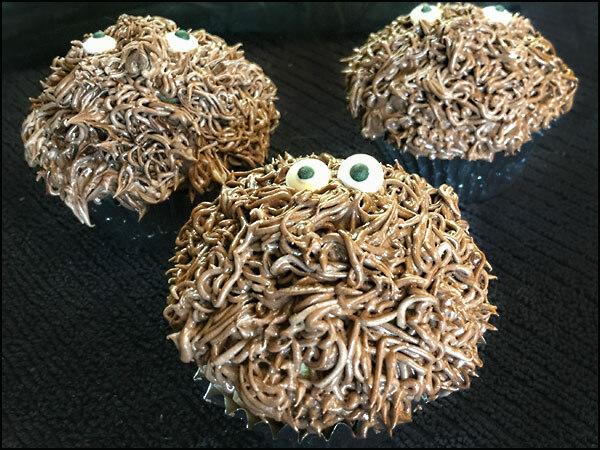 I baked my favorite cupcake recipe from Seaside Baker and used Wilton tip #223 to make the fur on the tribbles and Wilton Candy Eyeballs for the eyes. 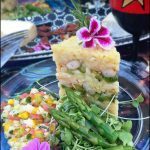 I love to stack food in molds for picnics because it travels well and is so impressive when it is revealed on your guests plate. My favorite cookbook for vertical food is “Stacks – The Art of Vertical Food” by Deborah Fabricant. My co-worker at Fox Sports bought me this book & kit more than 15 years ago and I cook from this book more than any other I own. I used the triangular & pyramid molds for this dish. 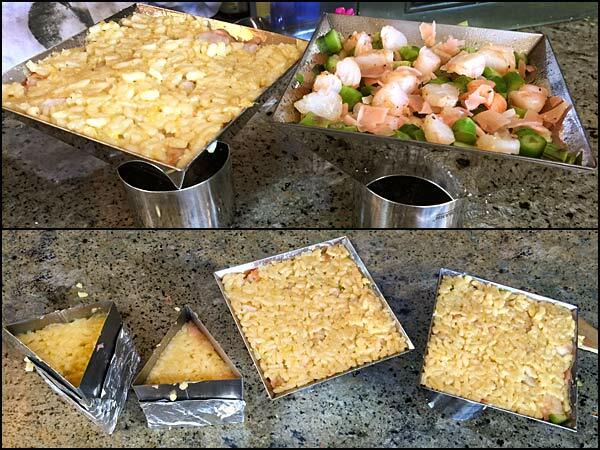 Pyramid molds can be placed on top of other molds or ramekins to balance while filling and cooking. Use an insulated heat proof lunch bag for transporting. Keeps food warm for 4 hours. 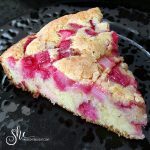 This stacked dish is summer entertaining at its best-easy to prepare and pretty. 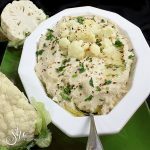 Serve it with a salad of baby greens. To make the asparagus, steam the spears for 4 minutes. Rinse in ice water, drain, and dice. Save a few asparagus tops for garnish. Set aside. Cook or grill shrimp, chop and set aside. the rice to coat well, about one minute. Add wine and stir until evaporated, about 30 seconds. Adjust the heat to medium-high. Add 1 cup of hot broth to the rice and stir until the liquid is absorbed. 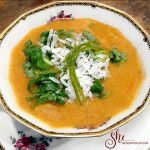 Continue adding broth 1/2 cup at a time, stirring and allowing liquid to be absorbed into the rice before the next addition. After 10 minutes add the lemon juice, stir until absorbed, and continue to add broth, stirring, as above. Total cooking time will be about 18 minutes. The rice should have a little bite to it and should not be mushy. Add the lemon zest, Parmesan, remaining butter, and thyme. Season risotto with salt, to taste. Stir well. Spray 6 stack molds with vegetable spray and place them on a sheet pan. If you are using pyramid molds add 1 teaspoon roe and push down into point of pyramid mold. If you are using any other shape, cover the outside bottom of the mold with aluminum foil to create a removable base. 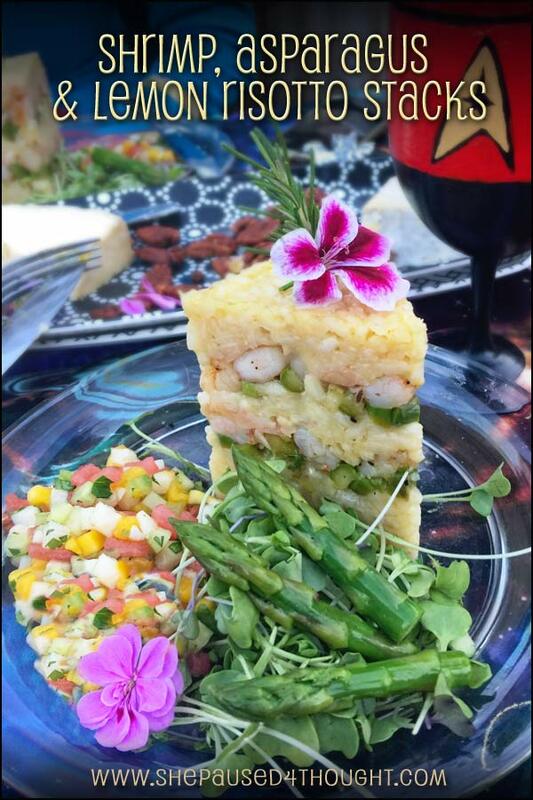 Layer in the following order: 3 tablespoons risotto, 1 tablespoon asparagus, 2 tablespoons shrimp, 1 teaspoon chopped pickled ginger. Repeat the layers and top with a third layer of risotto. Press down gently but firmly. 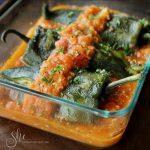 If you are traveling with this, cover the top of the open molds with aluminum foil & put in insulated heatproof lunch bag with a towel on the bottom. To serve, put the mold on plate and take the aluminum foil off the top of the mold. Gently pull the aluminum foil from the bottom while holding the mold in place. 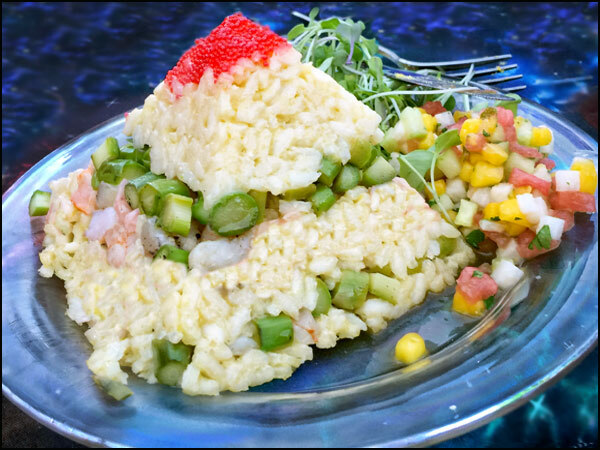 Use the tamping tool that comes with the kit to push the risotto out of the mold. If you are using pyramid molds, gently lift the mold up once plated. 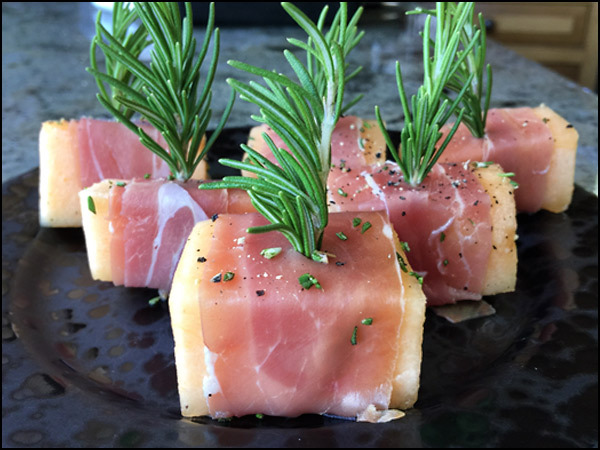 Serve with micro greens and garnish with asparagus tips. Be careful when making tribbles as they reproduce exponentially through presumably asexual reproduction, bearing an average litter of ten every twelve hours. Watch what happened to me. The good news it these cupcakes are so delicious I think they will disappear at warp speed before they can procreate. No promises they won’t reproduce on your thighs. Sigh. I can’t say enough wonderful things about the Hollywood Bowl. It is such a great experience no matter who you go to see there. Click on either photo below to see a sample video of our interstellar experience. 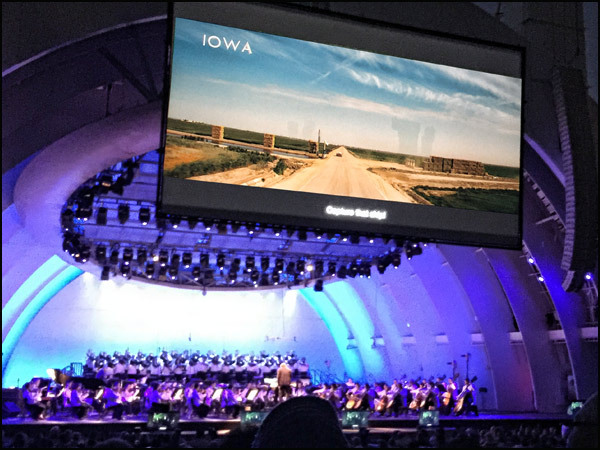 Seeing the whole movie shown in HD on the Bowl’s big screen performed live-to-picture by the LA Phil and choir was magical. And of course, I had to take a picture of the movie scene from Iowa, my home state. 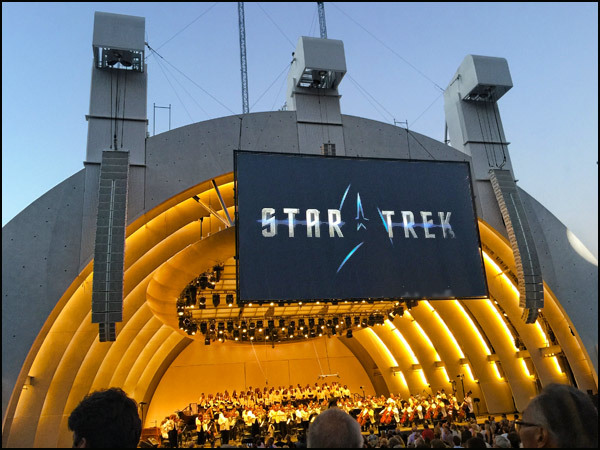 Hope you enjoyed our voyage to where no one else has gone before at the Hollywood Bowl. Wow! You went all out! And the food looks so fun too! Thanks Christina, we had an epic evening. Thanks Gaye. It was such fun planning such a crazy evening. thanks for stopping by! WOW!!! Is all I can say!!! I’m blown away!!! So much work… but for you… the creativity had to be worth your effort and I know everyone at the bowl wishes they had been at your table!!! Amazing!!! Yes, it was a lot of work, but the fun was well worth it. Glad you enjoyed it Cheri. Thanks Nan, so happy you liked it. You astound me! 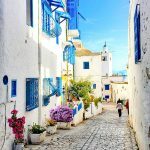 I am sharing on my Facebook page so all the Trekkers can see and copy you! Thanks Dorothy! I really appreciate it. This is crazy awesome! Only you would be able to pull this off perfectly, Cathy! How fun!! I’m sharing too! Thanks Christina. I could design themed-parties all day long as they are so much fun for me. I love a good challenge. Thanks Greg you are very kind! Thanks Priscilla, it was a very special evening for sure. Oh my goodness!! You are AMAZING! You’re inspiring me to get back to theme-dinners and parties. That looks like such a fun night! Thank you, themed parties are always so much fun.